David Oyelowo, so brilliant in a recent theater production of Othello, playing the king against Daniel Craig's Iago, is now a king again in Amma Asante's A United Kingdom. Groomed to take the throne of Botswana, Seretse Khama is studying in London where he meets an office girl, Ruth Williams (the lovely, angelic Rosamund Pike). They fall in love. Let us just say, in this period drama based on a true story, the racism works both ways; and the colonialism is in-your-face exploitative. Some lines in this movie had the audience cheering: one wag, predicting the white woman would not last as the king's wife in dusty Africa opines, "Wait till she finds out, there's no Buckingham Palace in Botswana." And when Ruth Williams is picked out of the typing pool, she asserts, "I'm no office girl." Every time a British official condescends to the king, he offers a sherry, a double dig as in Botswana the blacks are not allowed to drink. A pleased premiere crowd--including the director, cast and producers, Gay Talese, Geoffrey Fletcher, Nikki James, Barbara Kopple, and many more-- moved on to Avra Madison Estiatorio, posh as a palace, where--what else-- sherry was served on trays. Amma Asante shone in Forevermark diamonds, a sponsor of the evening. 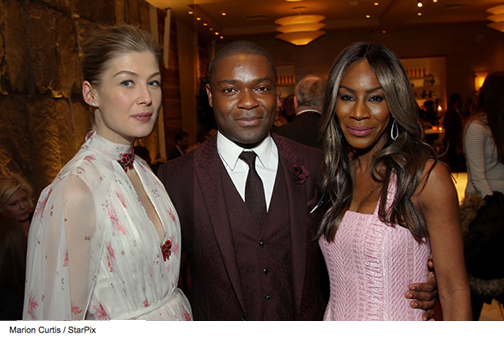 David Oyelowo, a co-producer as well as star was proud, his seven-year-in-the-making passion project was finally opening. Rosamund Pike said her favorite part of making the movie was learning to dance the jitterbug, which she does to perfection with David during the London courtship. Next up for this Canadian actress is a drama based on the 1976 Operation Entebbe, a counter terrorist rescue of Israeli hostages just as these events hit their 40th year anniversary. Good thing I'm making these movies, she said, "I'm catching up with history."